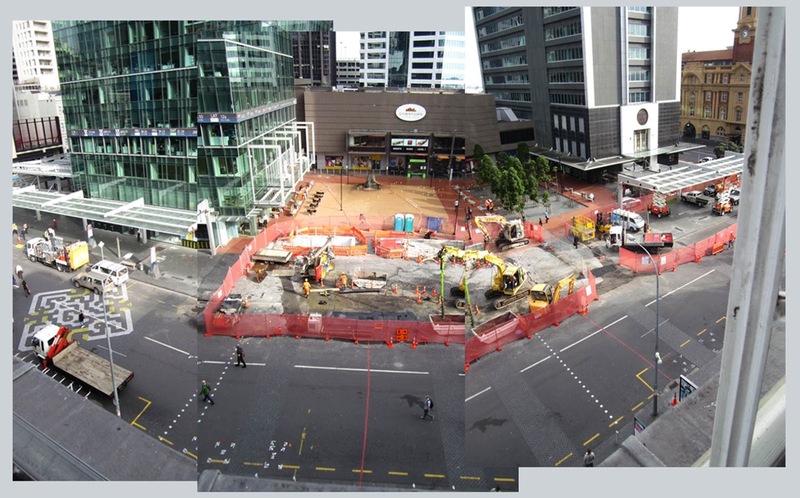 Auckland's Lower Queen Street bus station has been moved to Lower Albert Street. 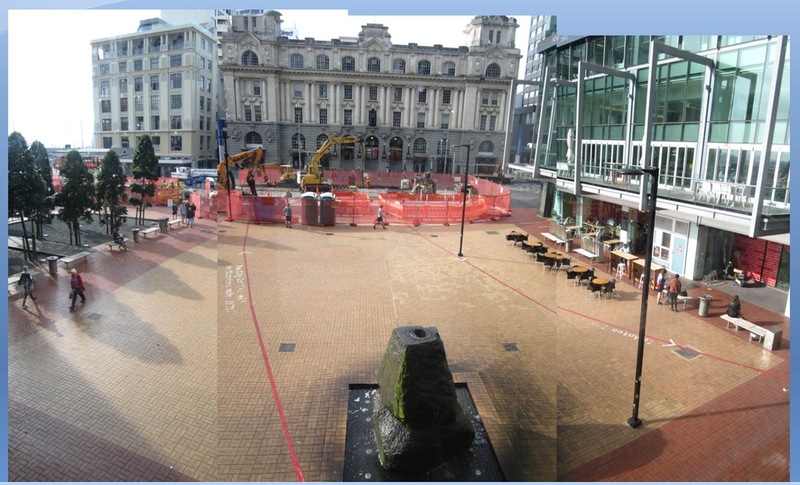 Partly to allow the Central Rail Link project to go ahead, and partly to allow Lower Queen Street to revert to public open space again. But is the new arrangement safe? I heard from a regular passenger transport user that the Lower Albert Street bus station was an accident waiting to happen, so I went and had a look. It's busy at the peak am. All the Northern Express buses unload there, buses from Birkenhead, and parts of Central and West Auckland. About a bus a minute while I was there around 8:30am on Thursday 19th May. Lower Albert is busy with car traffic - North and South - also. At the moment passengers alight the buses on the west side of Lower Albert Street. Most appear to want to go East - toward Britomart and other destinations in that direction. You see here a bunch of bus passengers crossing Lower Albert, heading east. This arrangement is the plan. It's what's wanted by the planners. But many people like the "desire line" of the shortest route. For example there are people coming out of the Downtown Shopping Centre (DSC), crossing Lower Albert to get to buses (in the pm peak that's even more likely). I understand that the DSC corridor is being closed around the 28th May (for demolition). So that risk won't be there for long. But long term plan is there will be an East West laneway through the rebuilt downtown shopping centre, and the desire line for commuters will be a direct one: get to or from the bus as directly as possible. That will mean crossing Lower Albert street. Precinct Property's proposed re-development of the downtown block includes a two vehicle width pavement crossing (about 40 metres down Lower Albert Street from Custom Street - approximately aligned with the oval DSC sign visible above). This will enable cars to access more than 250 underground car parks, and trucks and vans to access below ground service lanes for the development. That eastern side of Lower Albert Street will also be allocated to bus station and interchange. The same activities occur at the Harbour end of Lower Albert Street. While I was there the usual level of conflict was visible between cars and buses. The buses park close together. Perhaps an AT tactic to prevent commuters from stepping out between buses and onto Lower Albert Street. A lot of signs have been quickly put up to encourage people to only use pedestrian crossings. That's good and works for most. This AT guy - in the protective clothing - is moving up and down Lower Albert Street, a human barrier to commuters wanting the most direct walking route to their work and destination. You can see him here positioned between two double-decker buses, stopping people doing what they want to do. But he can't be everywhere at once, and it will only take one passenger to take a risk at the wrong time. Here's the kind of classic view we're working for. Lower Queen Street with a heritage background assemblage: Ferry Building; Shed 10: Endean Building and the old Central Post Office Building. And the time? Read the clocks - 5:10 on a balmy autumn Saturday. This guy was one of a sequence of street theatre performers who worked through the day. Was fun - maybe a little contrived - but fun nevertheless. Slightly earlier in the afternoon this one. Around 3:15 (read the clock). Another performer. Shows the beautful splash of sun you get through Queen Elziabeth Square at this time of day in autumn. Quite like this one too. A ship was in, and some of its passengers watched this, before leaving in the afternoon. Made a change I'm sure. The CBD had a bit of life. Was quite a good market on Takutai too. Good things are happening in downtown Auckland. Great things. Council has moved the buses off Lower Queen Street into Lower Albert Street. So now Lower Queen Street is back to the Pedestrian Mall it was declared to be in 1973. In these rough panoramas you'll see half the shelter gone. Pity they seem to have turned the gas flame off the spiritual sculpture. I think it should be left to burn. A light in the darkness.